A very nice start to the day with clear blue skies and sunshine. It was a clear and crisp day. 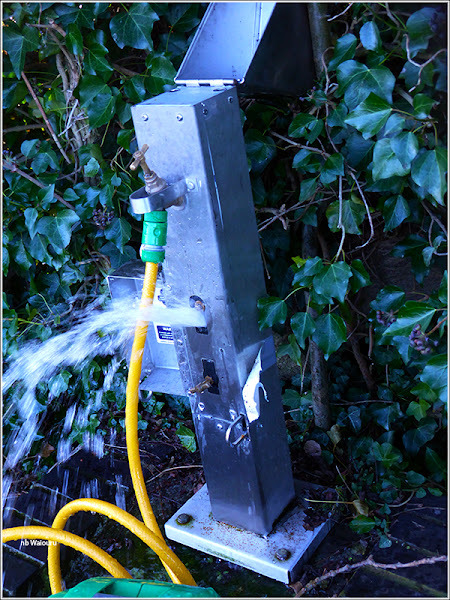 The first task was to ascend Slapton Lock and top up the water tank. The weather forecast is for cold and blustery conditions with the probability of snow. Filling the tank therefore seemed a sound idea. Unfortunately it turned out to be not quite as easy as anticipated. The water point wasn’t frozen, but it had a serious leak from the lower tap. This rather slowed down the process. Two locks on we struck our second problem. 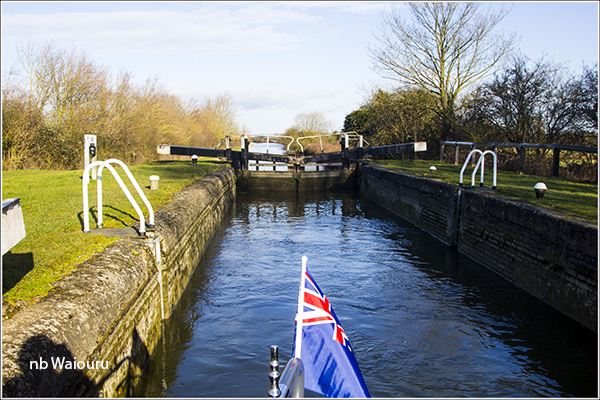 Entering Ivinghoe Lock 32 wasn’t the issue. 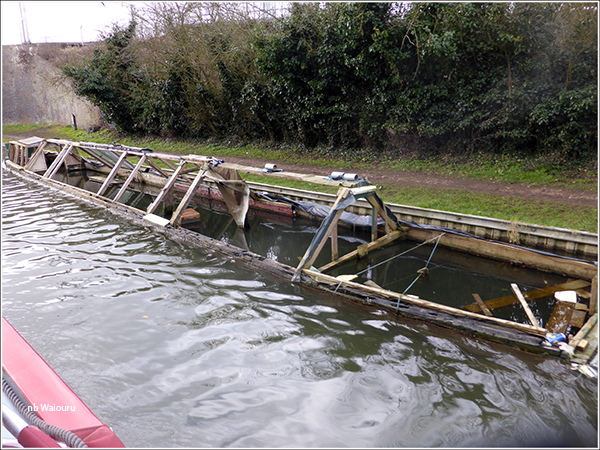 The problem was both the lower and upper sets of lock gates leak badly. We didn’t seem to be going up. Jan opened both top paddles and then walked back to check the leakage from the lower gates. We were about 2’6” from the top of the lock when I noticed the upper gates had decided to open without any assistance. That’s when we realised the pound above was very low. My first attempt to leave the lock was unsuccessful. Waiouru grounded on the cill! 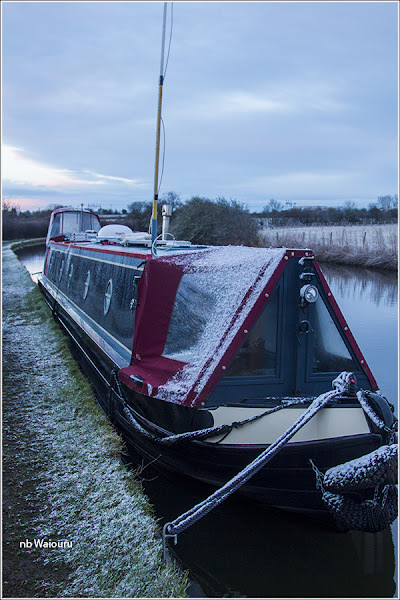 Jan walked forward to the next lock and ran down sufficient water to allow the boat to get over the cill and I then very slowly crawled forward to the next lock carefully staying on the centreline of the pound. Jan opened the lower gates on the lock and we both wondered if Waiouru would make it over the entrance cill. Fortunately we did. I was rather pleased we had pumped out the toilet tank in the stern and filled the water tank in the bow. There were no further water level problems for the remainder of the day. We passed three Interesting boats today. 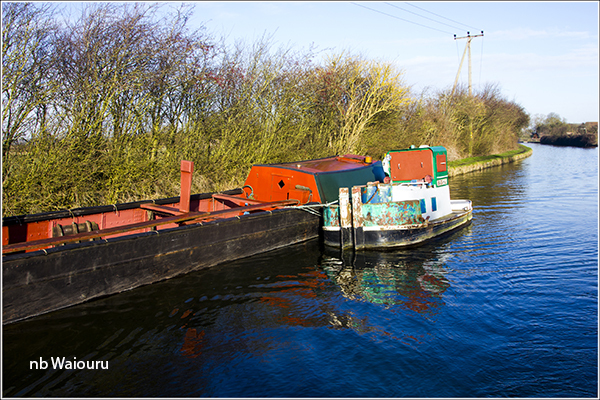 First it was a small tug (Bantam) and butty (Argus). I think it’s cheaper to license a butty than a powered boat so perhaps this is a cheap method of boating? 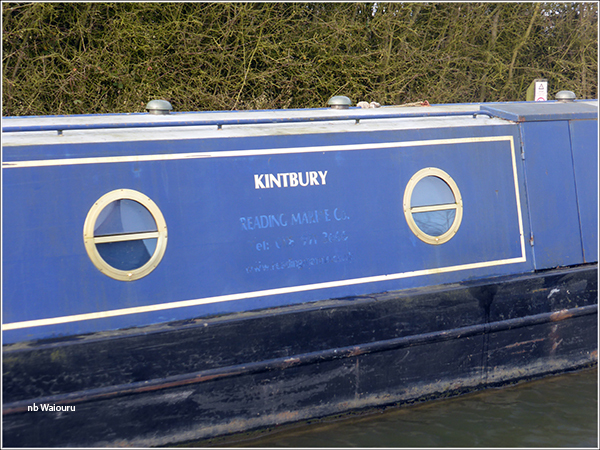 The last time we saw Kintbury she was one of the hire boats at Aldermaston Wharf. At the time we were told it was the last year she would be hired out and obviously she has now been sold. You can just see the faded ‘Reading Marine’ words where the decals have been removed. This last boat looked so sad. It’s probably been abandoned and the cost of recovery will likely be borne by CRT. Jan walked on ahead to open Seabrook Swing Bridge. I couldn’t see her from Waiouru and the bridge seemed to be barely moving. Once it was open I was able to see what the problem was. 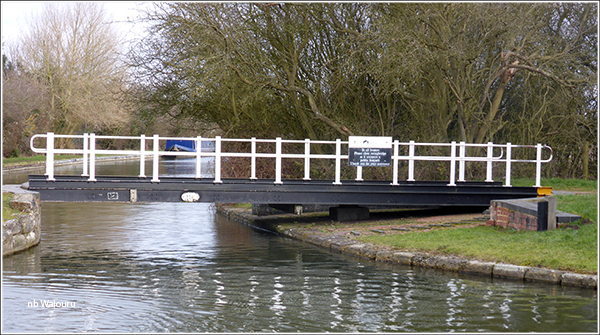 Unlike most of the other swing bridges we’ve seen this one doesn’t have an extended opening bar to provide greater leverage. Poor Jan was struggling to open and close it. She managed to get it sufficiently closed for me to cross and assist her with the final push. 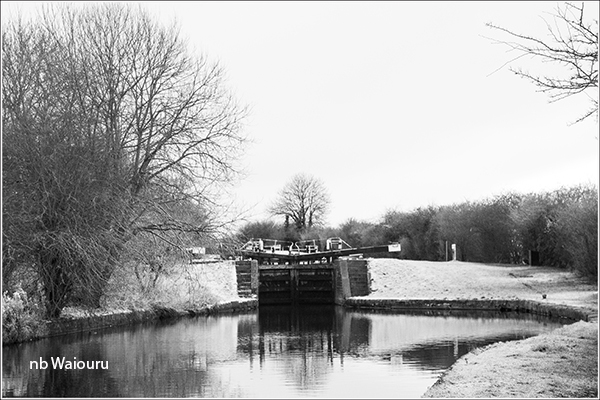 The mercury started to fall as we slowly cruised past the moored boats at Dunstable District Boat Club so a decision was made not to complete the final two locks before Marsworth Junction. We managed to moor in the wind and get the wigwam pram cover erected. I then raised the TV mast and guessed which way to point it (there being no buildings around to check). A good guess because we have both terrestrial TV and ‘The Dot’. We’d not long been inside the cabin when the wind started to seriously blow followed by snow. If the weather looks miserable tomorrow we will stay moored and sit it out! 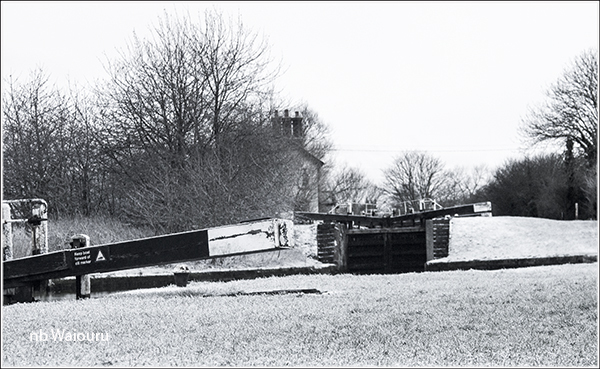 With this bridge as with a number of other swing bridges if you jump up and down on the towpath end it is easier to move, a tip passed to me by a friend while trying to close the swing bridge over the first lock on the Rufford Branch a few years ago. I've always found it works, it's to do with the bridge settling. You do get some funny looks but who cares if it works. How far south are you going? Hope you don't get frozen in tonight. I did tell (oops) suggest to Jan she try jumping on the bridge. In the end I did it whilst she pushed. :-) We're heading as far south as Bristol this year! We are planning to go in the reverse direction! But first we want to cruise the Lee & Stort. Nice set of Snowy pictures there. First I've read of you cruising plans this year, was it under wraps or did I miss a post!? Be glad to read of your experience down this end of the woods. I can't remember whether we have previously mentioned our 2015 cruising plans. But we are going to cover the south this year!